Miocene to present Possible Paleocene appearance. The bird order Casuariiformes has four surviving members: the three species of cassowary, and the only remaining species of emu. The emus are classified in the family Dromaiidae, while the cassowaries are all located within the Casuariidae family. All four members of the order are very large flightless birds native to Australia-New Guinea. The emus form a distinct family, characterized by legs adapted for running. As with all ratites, there are several contested theories concerning their evolution and relationships. 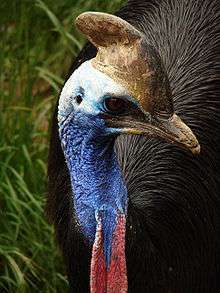 As regards this order, it is especially interesting whether emus or cassowaries are the more primitive form: the latter are generally assumed to retain more plesiomorphic features, but this does not need to be true at all; the fossil record is also ambiguous, and the present state of genomics does not allow for sufficiently comprehensive analyses. A combination of all these approaches with considerations of plate tectonics at least is necessary for resolving this issue. The total number of cassowary species described, based on minor differences in casque shape and color variations, formerly reached nine. Now, however, only 3 species are recognized, and most authorities only acknowledge few subspecies or none at all. The fossil record of casuariforms is interesting, but not very extensive. Regarding fossil species of Dromaius and Casuarius, see their genus pages. Some Australian fossils initially believed to be from emus were recognized to represent a distinct genus, Emuarius, which had a cassowary-like skull and femur and an emu-like lower leg and foot. In addition, the first fossils of mihirungs were initially believed to be from giant emus, but these birds were completely unrelated. It has been suggested that the South American genus Diogenornis was a casuraiiform bird, instead of a member of the current South American ratite lineage, the rheas. If this was the case, not only it expanded the fossil range of this lineage spatially, but temporally as well, since Diogenornis occurs in the late Paleocene and is among the earliest known ratites. ↑ Lockyer, Norman (14 October 1875). Nature. 12. London, UK: Macmillan and Co. pp. 516–517. ↑ From "Emu" + "Casuarius". Describer W. E. Boles commonly refers to the genus as "emuwaries" or "cassomus". ↑ Mikko's Phylogeny Archive Haaramo, Mikko (2007). "PALEOGNATHIA- paleognathous modern birds". Retrieved 30 December 2015. ↑ Paleofile.com (net, info) "Archived copy". Archived from the original on 2016-01-11. Retrieved 2015-12-30. . "Taxonomic lists- Aves". Archived from the original on 11 January 2016. Retrieved 30 December 2015. ↑ Perron, Richard (2010). "Taxonomy of the Genus Casuarius". Retrieved 30 December 2015. Boles, Walter E. (2001). "A new emu (Dromaiinae) from the Late Oligocene Etadunna Formation". Emu. 101: 317–321. doi:10.1071/MU00052. Brands, Sheila (Apr 8, 2012). "Taxon: Order Casuariiformes". Project: The Taxonomicon. Retrieved Jun 17, 2012. Wikimedia Commons has media related to Casuariidae.